The CS-DV4U protects and organizes the camera and the essential spare battery, tape, microphones and rain cover. It fits popular cameras such as the Sony PMW-EX1, HVR-V1U, HVR-Z1U, HDR-FX1, Canon XH-A1, XH-G1 and the Panasonic HVX-200. The bottom panel is reinforced with 8mm hollow core plastic, foam layers and a NEW layer of Slip Not fabric, which adds an extra layer of protection against water, dirt and grime with an easy wipe-off surface. 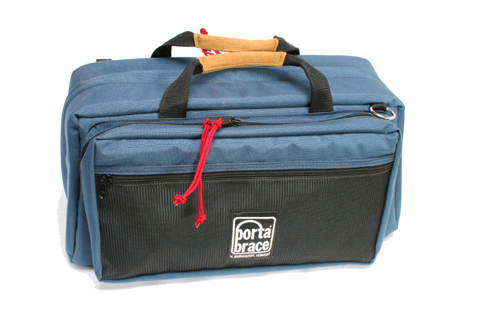 1” thick foam, 1000 denier Cordura Nylon with a coating of polyurethane waterproofing provides long lasting protection. The cradle inside is adjustable and stays where you put it to keep the camera from shifting. Also included: One small, padded pouch, a suede shoulder strap and a white balance card. 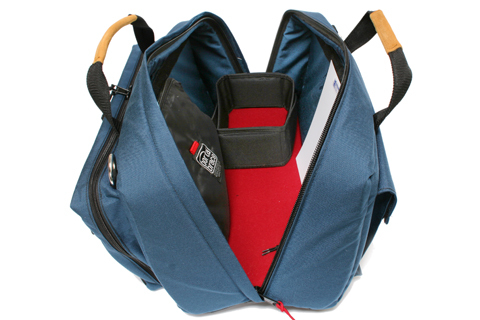 One large exterior pocket holds, optional Rain Cover, Cables, and a wide slip pocket for white balance card, owner’s manual, maps airline tickets, etc.